THILO HEINZMANN (b.1969. Lives in Berlin) began working with Styropor soon after he completed his studies at the Frankfurt Städelschule (1992-97) where he had already started exploring his fascination with natural pigments derived from rock and glass. Moving to Berlin in late 1997, he began using standard sheets of this most modern of materials. Purchased from different suppliers for the varying character of their surfaces and finishes, these were then cut and broken by hand and brought together in patterns that he had previously resolved in drawings. 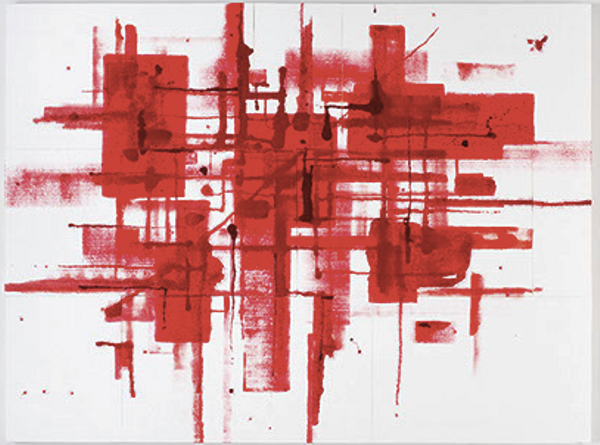 An example of these early Styropor Paintings is ‘O.T.’ from 1999/2000, where a variety of red pigments and epoxy resins are mixed and applied. First with a roller and scraper, then as drips and drops, which are absorbed into and encrusted onto the surfaces. By 2001, Heinzmann had begun to use mouth-blown glass as another method of adding colour to his white surfaces. Bought in sheets sourced from specialist modern and antique dealers across the world, this is a feature of the most recent work in the exhibition from 2017. His use of more sculptural, hand-cut Styropor shapes (seen here in ‘Venus’ 2008) began in 2005 and persists in parallel with the pre-fabricated sheets. In some cases the surfaces are post-treated to further alter the texture of the material’s facets. Why Styropor? Heinzmann states clearly that he is first and foremost a painter. A painter must contend with the very loaded tradition of canvas – that remarkable but uniform material in use for centuries, the 0-1 code, the warp & weft stretched over a wooden frame, is a medium Heinzmann still uses and reveres. The artist is equally attracted to this material that is modern, chaotic in its make up and therefore, in a way, more natural. These are his new proposals for the possibilities of painting. The progressive nature of Styropor, it’s technical lightness as well as the quality of the way it reflects light, made this a logical step for Heinzmann and has been a key element of his practice for over 20 years.